2.1 2.1. Targetoid hemosiderotic hemangioma (THH). Main false positive diagnosis: Melanoma, Kaposi sarcoma. False positive diagnosis – cite! False positive diagnosis (message) False positive diagnosis – participate! 1. Seborrheic keratosisThis glossary term has not yet been described. 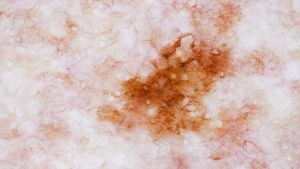 The vast majority of SK are easy to recognize dermoscopically, since they display one or more of the dermoscopic criteria that are well-known to typify SK. However, several SK variants do exist, some of them characterised by peculiar dermoscopic features that might mimic a malignant tumor. Comparing to the networkThis glossary term has not yet been described. of melanocyticThis glossary term has not yet been described. tumors, the network of reticular SK and SL is characterized by thinner lines and larger holes and ends abruptly at the periphery without fading out. Melanoakanthoma is a heavily pigmented variant of SK, which is often “false positive” dermoscopically, mainly because the presence of intense pigmentation does not allow the visualization of SK-related dermoscopic features (5). Irritated SK lacks the typical SK-related dermoscopic features (comedo-like openings[[Comedo like openings]], milia-like cystsThis glossary term has not yet been described. etc) and is typified by vesselsThis glossary term has not yet been described. of various morphologies (hairpin, glomerular, tortuous) which are usually surrounded by whitish halos. The presence of perivascular whitish halos is known to represent a sign of keratinization which might be seen in several keratinizing tumors including squamous cell carcinoma, common wartsThis glossary term has not yet been described. and SK. Some cluesEvidence, in an investigation to discriminate between SCC and irritated SK do exist: irritated SK is usually characterized by a symmetric distribution of structuresThis glossary term has not yet been described. (vessels surrounded by halos), in contrast to the more uneven arrangementThis glossary term has not yet been described. of features in SCC. Furthermore, SCC rarely displays multiple white halos surrounding vessels as the only dermoscopic feature. If present, usually white halos in SCC are combined with white circles surrounding hair follicles or structureless whitish areas. 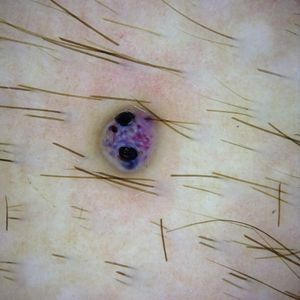 This peculiar SK variant dermoscopically displays globular structures of brown or blue-gray colorColor (American English) or colour (Commonwealth English) is the characteristic of human visual perception described through color categories, with names such as red, yellow, purple, or blue., which might be misinterpreted as irregular globulesGlobules with variability in color, size, shape or spacing and distributed in an asymmetric fashion of a melanoma or blue-gray ovoid nestsclods blue large clustered of a basal cell carcinoma (4-6). The sharp demarcation of the lesion at the periphery or the co-existence of SK-specific structures (ex. milia-like cysts) might helpRefers to giving assistance or support to others for mutual benefit to recognize SK. 1.5. Lichen planusThis glossary term has not yet been described.-like keratosis (LPLKLichen planus like keratosis). Main false positive diagnosis: MelanomaThis glossary term has not yet been described. LPLK is a term used to describe a SK/SL undergoing regressionThis glossary term has not yet been described.. LPLK dermoscopically displays the usual features associated to the regression process, namely blue-gray granules and white color. The clinically relevant problem is that precisely the same features typify also regressive nevi and melanomas. In early stages of regression of a LPLK, the typical features of SK/SL might still be present in some parts of the lesion, allowing its recognition. However, the presence of extensive regression usually does not allow a safe recognition of the pre-existing lesion. Therefore, lesions displaying extensive regression should always be histopathologically examined. 2. AngiomaAngiomas are benign tumors derived from cells of the vascular or lymphatic vessel walls (endothelium) or derived from cells of the tissues surrounding these vessels. Angiomas are a frequent occurrence as patients age, but they might be an indicator of systemic problems such as liver disease. They are not commonly associated with malignancy.This glossary term has not yet been described. Similarly to SK, the vast majority of angiomas are easy to recognize, based on the presence of the well-circumscribed vascular lacunas. However, some of them might acquire a peculiar dermoscopic pattern usually as a result of traumaThis glossary term has not yet been described., thrombosis or hyperkeratosis. 2.1. Targetoid hemosiderotic hemangiomaThis glossary term has not yet been described. (THH). Main false positive diagnosis: Melanoma, Kaposi sarcomaThis glossary term has not yet been described.. Occasional thrombosis might occur in any angioma and is often combined with bleeding. Thrombosed blood is black-colored dermoscopically and might be restricted within the lacunas or be more diffuse. 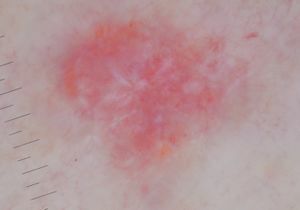 Dark lacunae, red lacunae and whitish veil are the most frequent dermoscopic criteria of angiokeratomas. Dark lacunae represent the most useful feature, having a sensitivityThis glossary term has not yet been described. of 93.8% and a specificityThis glossary term has not yet been described. of 99.1% for the diagnosis of angiokeratomais a benign cutaneous lesion of capillaries, resulting in small marks of red to blue color and characterized by hyperkeratosisThis glossary term has not yet been described. when compared with several other benign and malignant tumors. As a rule, the clinical diagnosis of DF is mainly based on the palpation of the tumor. Dermoscopically, the most characteristic pattern of DF consists of a central white patchCentral white structureless area and peripheral delicate brownish network. However, several peculiar DF types do exist. In addition to the aforementioned “typical” dermoscopic criteria, several other dermoscopic patternsThis glossary term has not yet been described. have may be seen in DF: central white network and peripheral network, central homogenous pigmentation and peripheral network, central white patch and peripheral homogeneous pigmentation, white network throughout the lesion etc. The main dermoscopic features of hemosiderotic and aneurysmal DF are a central homogenous bluish to red-brownish area with white linear structures and a peripheral delicate pigment network with vessels of various morphologic types. Adnexal tumors might be divided in 3 types, according to their origin: follicular, sebaceous and sweat gland tumors. Dermoscopically, several of them have been described to mimic mainly BCC, but also melanoma. Therefore, adnexal tumors represent a frequent cause of false positive diagnosis. In general, the dermoscopic pattern of follicular tumours displays features overlapping with BCC, namely linear branching vessels and blue-grey dots or globulesThis glossary term has not yet been described.. The common presence of ‘white structures’ has been suggested as a dermoscopic clue, suggestive of the diagnosis of a follicular tumour. 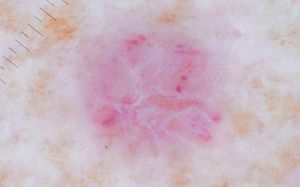 Specific dermoscopic criteria have are associated with some tumours, such as the unique ivory-white background colour that typifies desmoplastic trichoepithelioma. Sebaceous hyperplasiaThis glossary term has not yet been described. is dermoscopically typified by a whitish umbilicated, polylobular or structureless centre, surrounded by elongated, scarcely branching vessels (crown vesselsRadial serpentine or arborizing vessels at the periphery of the lesion that radiate towards the center but do not cross the midline of the lesion. sebaceous hyperplasia). A similar pattern consisting of central whitish/yellowish structures and crown vessels characterizes sebaceous cysts. The remaining sebaceous tumors are much more difficultneeding much effort or skill to accomplish to recognize. A possible clue is the combinationThis glossary term has not yet been described. of yellowish structures with unfocused arborising vessels. Eccrine poromaThis glossary term has not yet been described. is the most well-studied sweat gland tumor and has been suggested to display a great dermoscopic variability, potentially mimicking all known malignant tumors. 5. NeviThis glossary term has not yet been described. 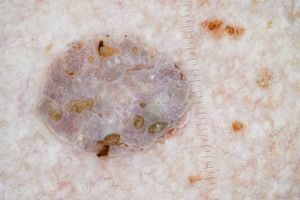 The clinical, dermoscopic and histopathologic overlap between some Clark nevi and early melanoma is very well-known. Clark nevi may display one or more of melanoma-specific criteria, such as asymmetry of colours and/or structures, atypical netwok, irregular globules, regression etc. This problem is particularly relevant in patients with the so-called atypical mole syndrome. 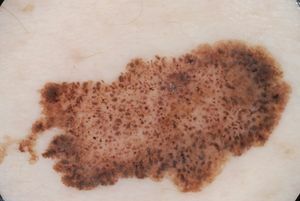 The most efficient (and safe) strategy to reduce the number of excisions of nevi is the application of the comparative approach, which is based on the notion that the majority of an individuals’ nevi are morphologically similar among them, while melanoma deviates this “signature pattern”. Therefore, the comparative approach suggests that, in individuals with multiple atypical moles, instead of trying to measure the degree of each mole’s atypic, one should search for the morphologically different lesion (“ugly duckling”). Three dermoscopic patterns of Spitz and Reed nevi have been thoroughly studied. Reed nevi are typified by the so-called “starburst” pattern, consisting of a dark brown/black/blue centre and symmetrically distributed peripheral streaks or pseudopodsBulbous and often kinked projections seen at the lesion edge, either directly associated with a network or solid tumor border.. Pigmented Spitz neviThis glossary term has not yet been described. are characterised by the presence of symmetrically distributed globules and white spaces among them (inverse network or reticular depigmentation). Non-pigmentedThis glossary term has not yet been described. Spitz nevi are typified by the presence of symmetrically distributed vessels (usually dotted) and white spaces among them (inverse network). All the aforementioned patterns are characterised by a symmetric distribution of structures. The same structures (streaks, pseudopods, vessels, inverse network), if not symmetrically distributed, represent melanoma criteria (irregular streaksThis glossary term has not yet been described., irregular pseudopods, atypical vessels etc). Therefore, the morphologic overlap between Spitz/Reed nevi and melanoma is obvious, since any Spitz/Reed nevus deviating the perfect symmetry is, by definition, looking like melanoma. The problem of how toGives basic instructions and directions to someone on the methods for doing or making something. manage a spitzoid-looking lesion gets even more complicated by the fact that spitzoid melanomas perfectly mimicking a symmetric Spitz/Reed nevus do also exist. To address this problem, the International DermoscopyThe examination of [skin lesions] with a 'dermatoscope'. This traditionally consists of a magnifier (typically x10), a non-polarised light source, a transparent plate and a liquid medium between the instrument and the skin, and allows inspection of skin lesions unobstructed by skin surface reflections. Modern dermatoscopes dispense with the use of liquid medium and instead use polarised light to cancel out skin surface reflections. Society has recently released managementThis glossary term has not yet been described. guidelines (see “ManagementThis glossary term has not yet been described. of Spitz nevi”). 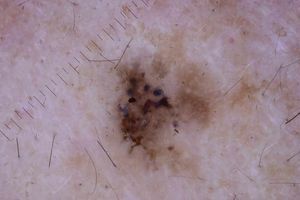 The co-existence of 2 different melanocytes proliferations within the same nevus results in a peculiar, asymmetric dermoscopic pattern, often resulting in a false positive diagnosis of melanoma. The most frequent combination (blue nevusis a type of melanocytic nevus that clinically and dermoscopically will appear blue plus compound/dermal nevus) is dermoscopically characterized by peripheral network or globules and a central homogenous blue area. Of note, the blue area is often rather eccentric than central. The safest way to classify a recurrent pigmentation within/on a scar is to re-evaluate the histopathologic report of the primary tutor (if available). If not, the differential diagnosis between recurrent nevi and recurrent melanoma is based on the time of recurrence and the precise distribution of the pigmentation. Specifically, nevi typically recur quickly (up to 6 months after excision) and the recurring pigmentation is restricted within the scar of the previous excision. In contrast, melanoma usually recurs several months to years after excision and tends to expand beyond the borders of the scar onto the normal skinThis glossary term has not yet been described.. 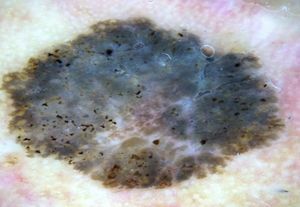 This peculiar nevus subtype might clinically and histopathologically mimic regressive melanoma. Dermoscopically, nevi with regression-like fibrosis display both white and blue/gray (pepperingGray dots) regression structuresThis glossary term has not yet been described. that usually extend on 10% to 50% of lesion’s surface), without any other melanoma specific criteria. Typically the regression area is located in the centre of the nevus. This page was last modified on 26 July 2018, at 04:19.